Of late, many damsels have been doing their best to become socialites and/or to gain fame, which ain't easy. What many lasses are doing for fame and money is alarming. Vera Sidika, Huddah Monroe and Corazon Kwamboka are arguably the top socialites in Kenya but lately, other up and coming voluptuous wenches are giving them a run for their money. Judy Anyango is doing her best, and so is Bridget Achieng, a well endowed lass who has tempting and juicy assets. Her ‘German Juice’ is one of a kind and it always leaves team mafisi desperately yearning and begging for more. 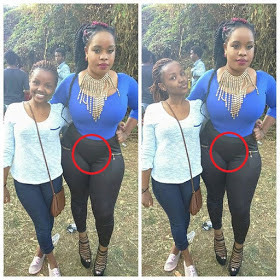 Recently, she decided to to ‘reward’ her fans, especially team mafisi by flaunting her ‘nini’ in public. Take a look.